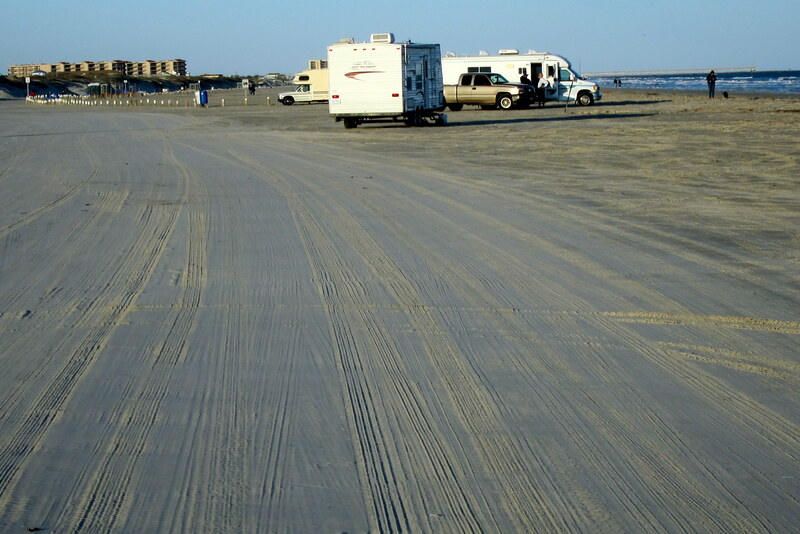 Wednesday, January 26th through Sunday, January 30th, 2011—Texas Gulf Coast: We are still camped at NAS Corpus Christi, Texas and enjoying this centrally located site for further exploration of the area. 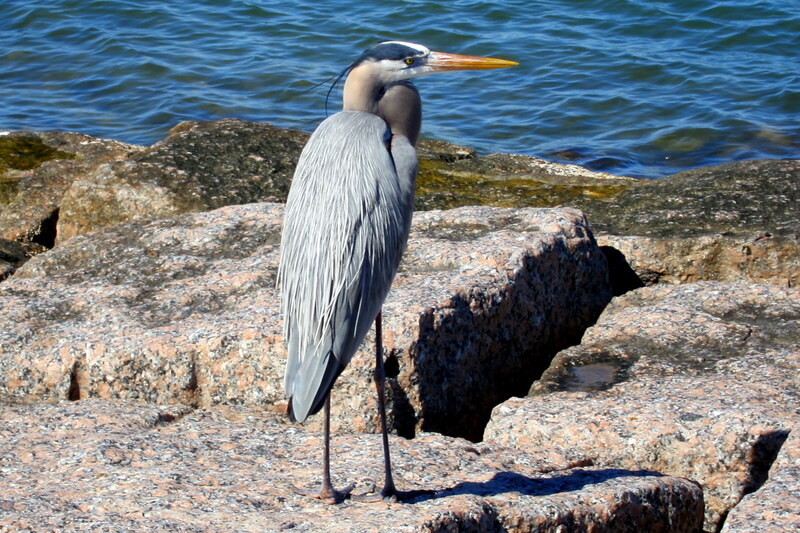 A day on Mustang Island: Port Aransas Is on Mustang Island, one of the many barrier islands that nature has provided to protect the Gulf Coast shoreline. It is a resort beach community, not unlike Old Orchard Beach, Maine. 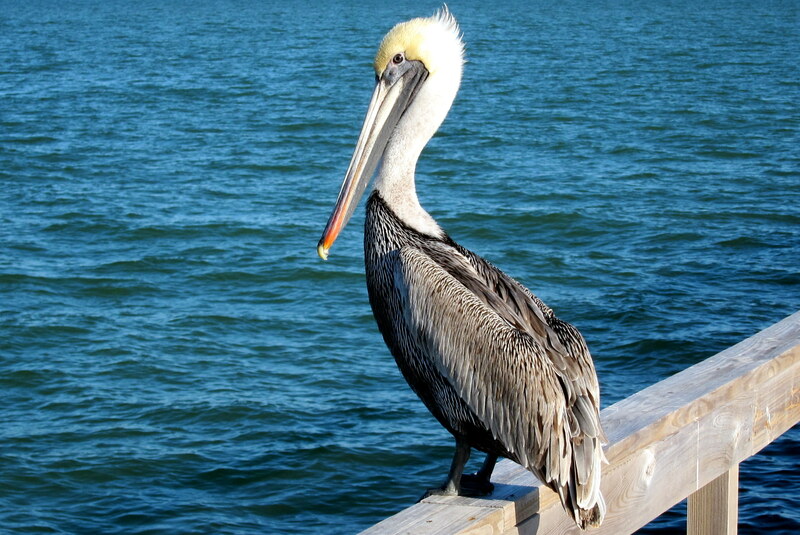 Port Aransas features the usual seafood joints, gift shops, taverns and surf shops. Here is the entrance to one of the larger tourist shops. I gotta tell you…..it was kinda weird walking through the digestive system of that large fiberglass shark and coming out the other end right into the main part of the shop. However after looking at the millions of pieces of Chinese goods I’m convinced most of the merchandise took the same path. After poking around a few island shops we enjoyed a great seafood dinner at a place called Fins which was right on the water. Fried Oysters for me and a Crab Cake for Kit…..both fresh and very good. The restaurants even catered to the sport fisherman in the area in that they will cook your days catch and serve it with all the traditional side dishes. 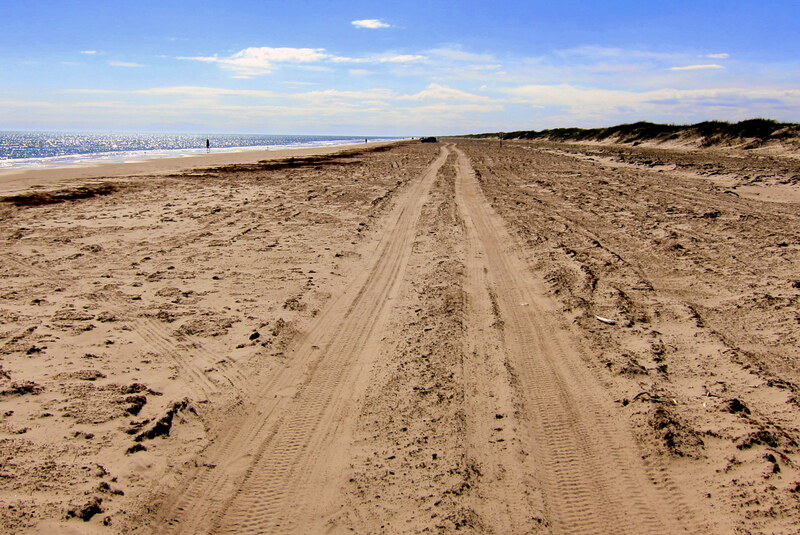 In this area of Texas the beach is used as part of the public highway, weather permitting, and was as smooth as many paved roads. We drove many miles of the beach and stopped often to do some beach combing. And as you can see from the photo below camping is allowed right on the beach for a nominal fee. Our next trip to this area, and there will definitely be a next time, we will plan on spending a few days camping on the beach. Of course this would be a dry camping opportunity…..unless there is a particularly high tide. 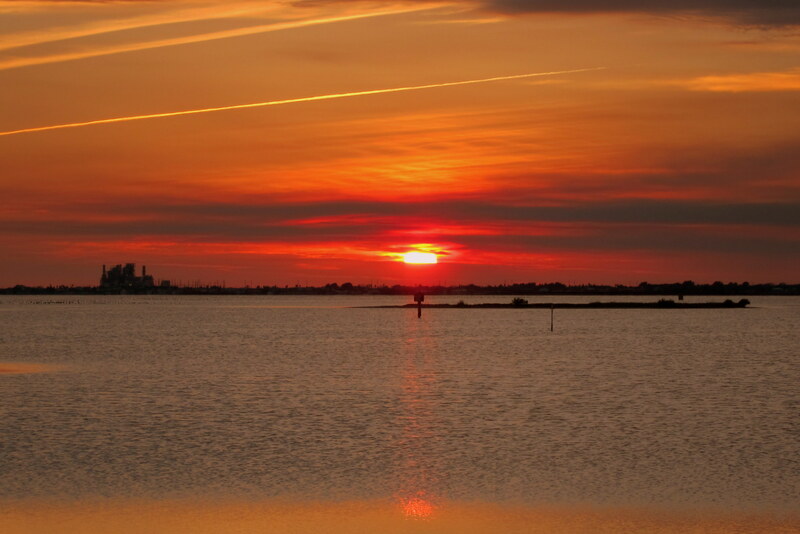 The sunsets across the Laguna Madre, also known as The Gulf Intercostal Waterway, are spectacular. I bet the sunrises over the gulf from a beach campsite would be just as nice. 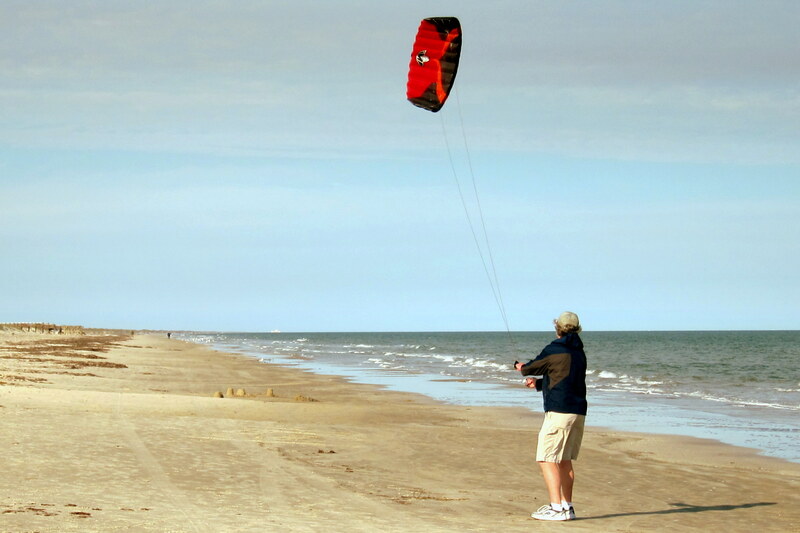 A day on Padre Island National Seashore: Our Golden Age Pass worked its magic once again as we paid no fee to enter this National Park facility. There are very few paved roads in the park. Just a few miles from the park entrance to the visitor’s center and to both developed campgrounds. 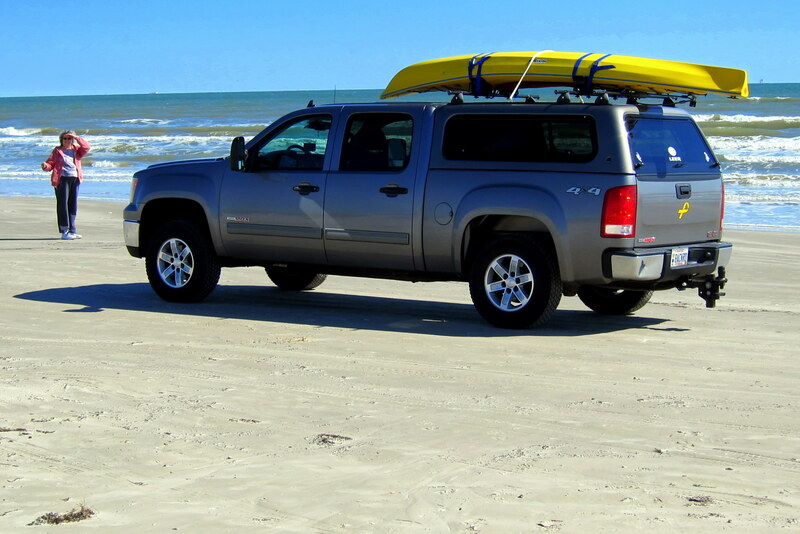 As in Port Aransas the rest of the traveling is done on the beach. The “road” in the photo above goes on for sixty miles…..and then one would have to reverse direction and drive back the sixty miles to get out of the park. The first five miles are pretty good and can be navigated by an average passenger car. From then on it gets a bit rough and the sand is softer. We drove down about fifteen miles before we pulled over to have a picnic. 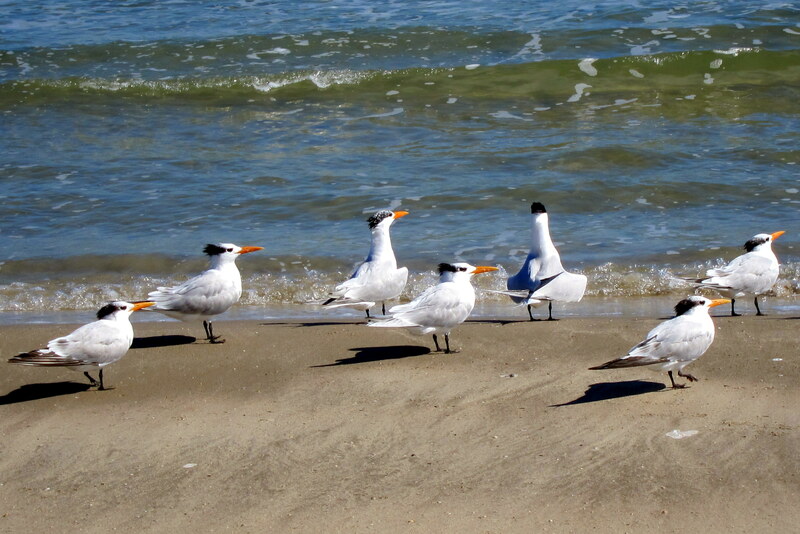 Padre Island is a wildlife refuge and a world recognized bird watching habitat. During the day we viewed many varied and unusual birds. The photos that follow are just a few of the many birds we encountered along with my feeble attempt to identify them. Although I will have to comment that those birds looked like little old and balding guys hanging around the park. If so…..I doubt they would be feeding the pigeons. And then we saw what I think might a Plover. 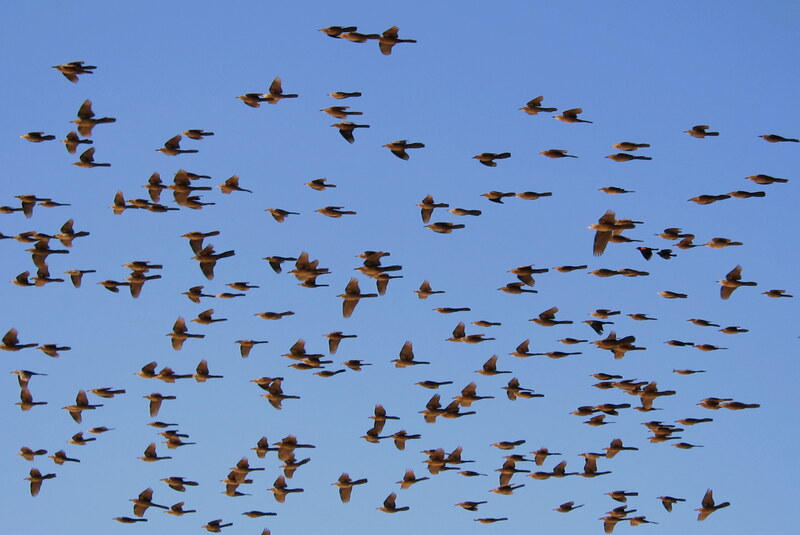 And a bunch of birds in flight that I couldn’t identify in the Bird Identification for Dummies book that we brought along. On all of the above, I’m going to have to rely on my buddy David to correct the mistakes and fill in the blanks. I’ve mentioned Dave before…..he is a wild bird expert and an accomplished wildlife photographer. Dave and his wife Betty live near us in Maine and they too escape the cold, however they flee to their home in Florida. To see some of Dave’s incredible wildlife photos please visit his website, A Wilder Side of Life at: http://davewhitewildlife.blogspot.com/. The consistent sea breeze provided many opportunities to play with my kites. Even though the kite in the photo below is a relatively small 1.5 meter parafoil there was enough breeze to, at times, drag me across the smooth sand. This area is world renowned for windsurfing and kite sailing. There are many places in the park that have wind socks and wind velocity flags to assist the folks who enjoy participating in those two wind powered sports. While I was out flying my kite, Kit was napping in the truck. Returning I snuck up on her and tried to snap a picture. Not quick and/or quiet enough…..she caught me and wasn’t none too happy. 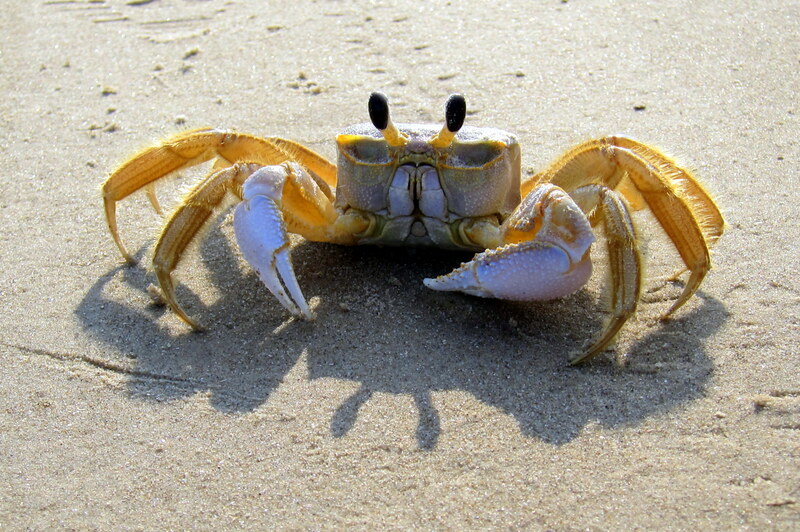 Just kidding…..actually that little fellow is a “Ghost Crab” and it was skittering about underfoot as I was trying to fly the kite. It’s a wonder I didn’t step on him. Kit’s Corner: Loved Port Aransas, especially the gift shop that swallowed Bill up and spit him out on the back side. I Didn’t buy anything there, but it was nice to just check things out. 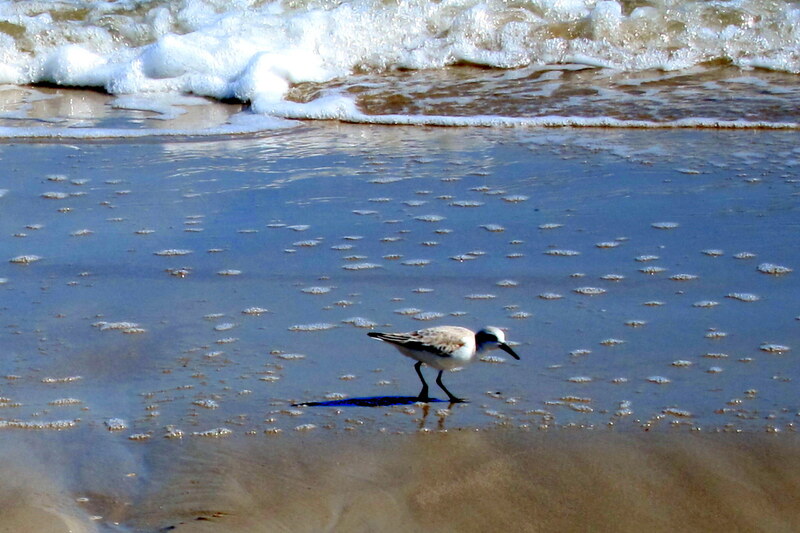 We loved the long unspoiled beaches in Port A and on Padre Island. Hope to go there again and camp on the beach. Nice wildlife shots Bill. In fact – very nice. You are correct on your ID skills also. Could be a good spot for me to check out if I can find a way to shorten the drive some. Keep moving and having fun. Thanks…..that means a lot coming from you. I have been using some of the techniques you taught me. Principally the locate, compose, focus and wait for the animal to come to you. I also take a lot of photos in burst mode which will ensure at least some of them will come out OK. Thanks for the tour! What you don’t know is how beautiful it is right now in Harpswell. The temperature went from 11 degrees to what it is now 35 —- almost like summer time. Even the glittering, slippery blue ice is weeping. Next week at this time we will start paying attention to the following week’s weather as we prepare to head south (Feb 24). Oh how I will miss zero temps and blue ice!!!!! Wonderful! Would have loved to have been there with you…………..perhaps on another trip. Well, we have not made the move to NC yet. But, I have decided that the next move is to TX. I liked everything I saw previously, but now I love it. Next trip, I volunteer to be a stow away. I love the pictures of the beach. I can’t wait until the east coast warms up so that I can enjoy the sun and the sand. the historical marker database. It is a collection of all of those historical markers that you pass as you drive down the road. The information includes a photo of the marker, a transcription of the inscription, additional information about the site, maps, directions how to get there, other nearby markers and monuments, links to other sites with more information, etc. The site seems to be very well organized and easily searchable. It even looks like you can download the information to “Lucy”. I have just started to investigate the site, but it looks like there are dozens of locations in my hometown; several hundred if I include Gettysburg in my search which is about 30 miles away. I hope that it proves useful to you and leads you to some interesting locations. Thanks for the link…..we had not seen that particular “road attraction” website. One that we do use, and that you may find interesting, is Roadside America at http://www.roadsideamerica.com/. We have stumbled on some roadside attractions that are not in their database however. When I have some extra time I intend to write a story for their website about them. Take care and have faith, summer is just around the next snowy corner. Hi – We miss you guys but sure do enjoy your website. Beautiful pictures. The weather here now is gorgeous. Do come back for a visit someday. Having grown up in South Texas, Laredo,we spent as much time as possible in Corpus Christi and Padre Island. 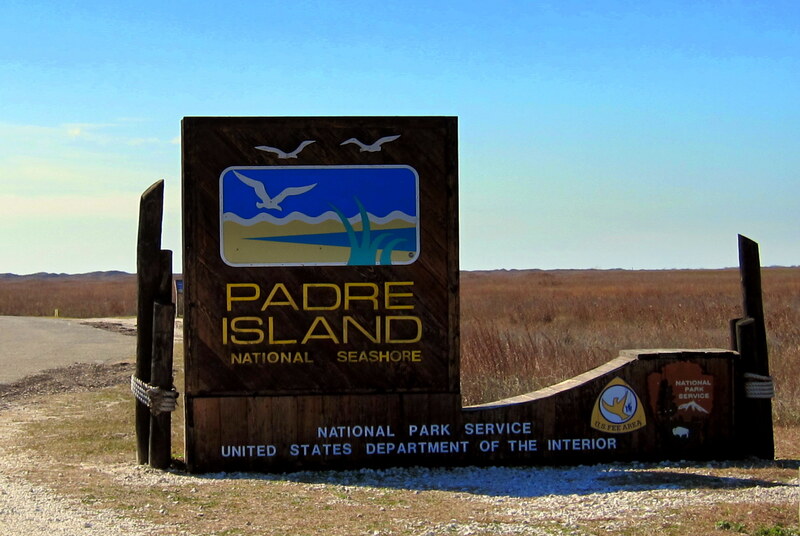 When I saw the photo of the sign for The Padre Island National Seashore, my mind played a trick on me and suddenly I was 16 again, Pulling up to the shore in my 1972 Green Super Beetle to spend the weekend swimming and camping on the shore. Thanks for the memory. Glad you enjoyed the journal and the teenage flashback. Looking forward to seeing you folks when we hit San Diego. Wished I had a chance to tell you about our family favorite places on Padre Island, Corpus and Aransas. Did you find the Port-A Hole? 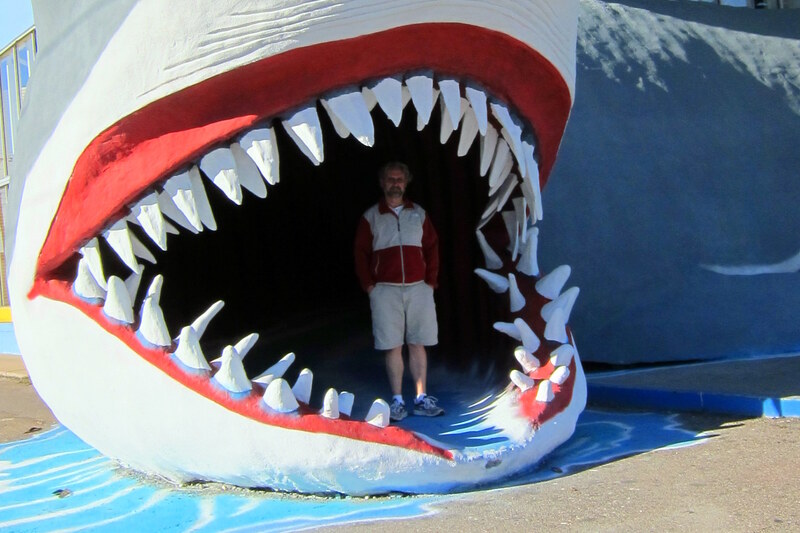 Sam only grudgingly allowed me to take a pix of him in the sharks mouth. Hope you tried Hemingway’s when you were out there. Don’t know where you are now, but as you head west, ponder your maps. The towns of Ozona, Balmorea, Alpine and Fort Davis deserve your attention. At Ft Davis, there is a state park in a box canyon at the end of which is a CCC-era adobe inn. It’s magical with mule deer and birds. There is also an observatory nearby and the old cavelry fort of Ft Davis is pretty cool ….. it was part of the Apache trail. out on OBX, there are signs telling you to Deflate your tires before you drive on the soft sandy beaches. Give that a try next time, but remember to have an air pump for when you are done. Your bike pump will work and you will look like Popeye when you are finished. Oh, you have to wear your Dixie Cup and have a corn cob pipe too.